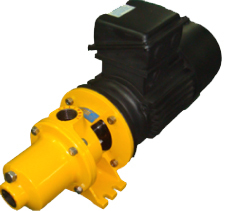 DP series Progressive pumps can virtually handle any kind of media from water like to highly viscous and corrosive in nature, there are no valve required so no airlock or vapour lock is possible. The flow is linear and non-pulsating and steady even with change in suction head . due to low internal velocity of media shearing and degradation is minimal. These are a highly cost effective solution to your pumping needs for media with less solid contents. Highly service friendly due to its simple construction and design. Extremely quick change of material due to its uni-Rotor shaft design.